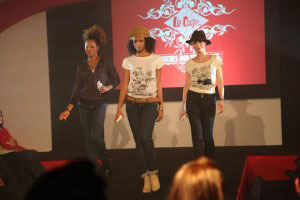 Devise a fashion show to launch the latest fashion collection from the English heritage brand Lee Cooper. Accelerate provided the most experienced creative director/ choreographers in entertainment today for the launch. Kwame Knight to date has choreographed over 500 live show events to audiences around the world. Known for his creative high energy, dance & fashion fusion shows. Kwame has devised numerous shows for one of the UK’s leading fashion brands. Innovative choreographic concepts helped to showcase the vast and diverse range of products on offer from Lee Cooper. The show clip you can see, is from the show that Kwame choreographed & directed at Berlin Fashion Week. The Fashion label relaunched its heritage British Brand at the fashion show. The concept was presented to an exclusive group of associates and licensees at the brand’s conference ‘A Taste of Things to Come’ last month, followed by the official launch in Berlin at the international fashion show. "The fashion show truly entertained our visitors whilst showcasing our new product."